As early as the mid 1970s, the City and various developers began looking at the 13.5 acre Lilac Way site, which was ripe for revitalization. Traffic problems caused by the construction of the 36th St. bridge starting in 1984 meant the death knell for Lilac Way. The site was demolished in 1988. Starting even before demolition, many plans were developed only to be discarded, some because of the after effects of the Beltline Pay Dump. An example was a $70 million plan proposed by the Boisclair Corp. in 1984. The project included an Embassy Suites Hotel, retail and office space, senior citizen housing, a cinema and two parking ramps. At that time the plan was to build around the water tower – in fact radiate out from it – because it would be too costly to demolish it (but they eventually did). Boisclair pulled out in 1986 because of “company finances.” (Bob) Boisclair had developed Riverplace in Minneapolis and Galtier Plaza in St. Paul. In 1985 a neighborhood group called EXCEL was formed to review plans for redevelopment in terms of traffic and safety. 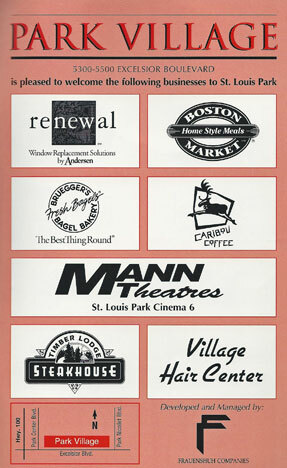 Then in 1987 the St. Louis Centre Partners came up with a $63 million project called “On the Avenue” that included a two-story enclosed shopping mall with restaurants and underground parking; a three-story atrium office building; an 8-story curtainwall office building; a luxury hotel, and a parking ramp. This plan called for the dismantlement of the water tower, replaced by a storage reservoir built into the face of one of the buildings. Also proposed was the start of St. Louis Park’s own skyway system. The development company was made up of Adolfson & Peterson, Rosewood Corp. and Pineapple Management Group. The plan never materialized. An article dated August 1, 1988, cited a multi-million dollar “On the Avenue” project. Another article said that students at Susan Lindgren Elementary School had formed a partnership with the city and developer to make the project an educational effort. Classes would study the history of the corner, suggest retail needs, photograph the demolition and construction and other projects. In 1992 another plan included a hotel, medical office, restaurant, and theater. It was named Tower Place. At that point the water tower was still there and plans were made to accommodate it. In July 1994 the City sold 6 acres to the Frauenshuh Companies, which redeveloped the site into a retail building called Park Village, part of Park Commons. 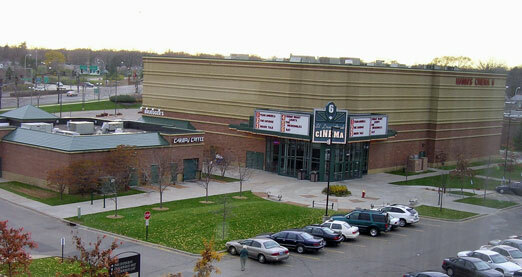 The rest of the tract was sold to Park Nicollet. The water tower was dismantled in November 1994. Andersen Windows opened a pilot store for replacement windows on August 17, 1995. The store was called renewal by Andersen. Boston Market: 5300 Excelsior Blvd. At first called Boston Chicken, this restaurant broke ground in July 1994, at the time one of 40 such restaurants to be built in the Twin Cities. On hand for the groundbreaking was none other than Ed McMahon. The company started in Newton, Mass. in 1985 and changed its name to Boston Market in February 1995. The company was purchased by McDonald’s in May 2000. 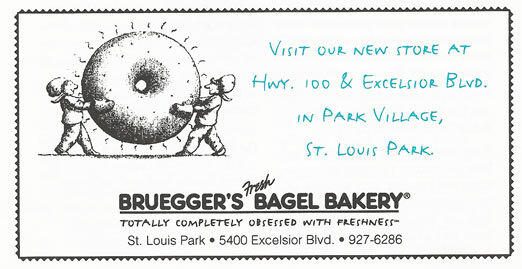 Bruegger’s Bagel Bakery: 5400 Excelsior Blvd. Open house was held on August 25-26, 1995. Bruegger’s (named after co-owner Nord Brue) was founded in 1983 in Vermont. Granite City is the nickname of our hometown of St. Cloud, Minnesota – one of the great granite capitals of the world. Back in the 1880’s, quarrying was hard, thirsty work. For miners of Northern European ancestry, that meant beer. So family breweries sprang up. They know the secrets of making beer to match the flavor of food made from scratch. With prohibition, the breweries all but vanished. But the spirit of Granite City is alive and well. Just look around you and raise a glass – To fresh made food, beer fresh brewed and all the delicious things in life! McDonald’s: 5200 Excelsior Blvd. This was the first business to open, on Friday, October 14, 1994. Minnesota Steakhouse briefly replaced Timber Lodge Steakhouse. Timber Lodge Steakhouse: Opened December 9, 1994. Closed 2006. Village Hair opened in October 1995 at 5440 Excelsior Blvd. It was owned by Lloyd Kugler and Jo Dudycha. One of the barbers was Vern Swanson, who had spent 59 years at 50th and France. At 81, Swanson worked part time at the shop.